Mansfields Field Mill football ground, which was named after a nearby cotton mill, has staged football since 1861. However Mansfield Town didn’t start playing there until 1919, it was another 12 years though before it saw League football when they were elected to the Football league. 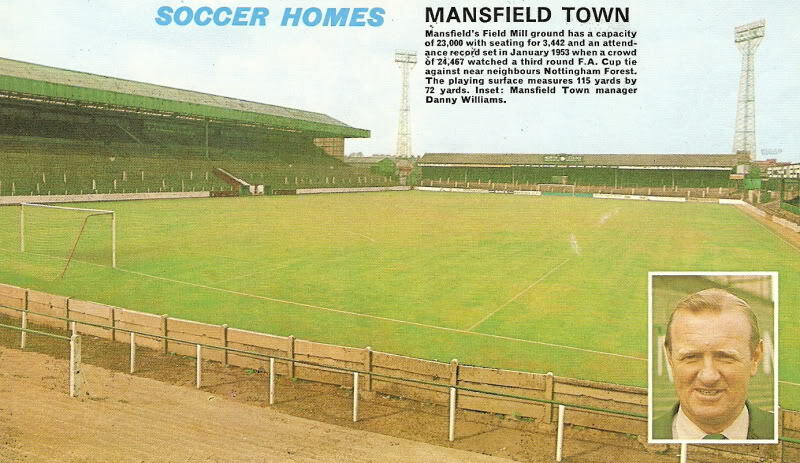 The picture below features the West Stand, this stand was actually formerly a racecourse stand which Mansfield purchased from Hurst Park Racecourse, the stand was opened in 1966 but not completely finished until 5 years later in 1971. The picture was taken from a Football Review magazine in the early 1970’s. "Mansfields Field Mill ground has a capacity of 23,000 with seating for 3,442 and an attendance record set in January 1953 when a crowd of 24,467 watched a third round FA Cup tie against near neighbours Nottingham Forest. The playing surface measures 115 yards by 72 yards. Inset: Mansfield Town manager Danny Williams."